We’ve settled into a routine in Helmand. I share a 20’ by 20’ room with three other men and a lot of dust. With all our kit and weapons it’s a squeeze. The trick is to be more tolerant than usual, especially with us all working different routines and sometimes getting up in the middle of the night to do a stint on guard duty in the sangars that ring the base. You work together to get along as to do otherwise would make a difficult situation unbearable. There’s no privacy, but you deal with it and pull together, settling into an easy intimacy and getting to know things about your mates only their wives would recognise. I get up at 6 and go to the gym before it gets too hot. We work 7 days a week but have a late start – 10:30 – on Fridays as it’s the Islamic holy day and we try to be aware of cultural sensitivities. Breakfast, then a short walk to work. We carry our helmet, body armour and weapon to work and back again in the evening so we’ve always got them to hand in the event of an attack on the base. Into the headquarters for 8 and wait for the TICs to roll in. TICs are reports of Troops In Contact, a firefight with the enemy – a benign phrase that does little to convey the fear and sweaty effort that goes with trying to outthink and outmanoeuvre another man trying to kill you. A man who regularly uses children as human shields, knowing we don’t shoot if there’s a chance of killing civilians, especially kids. The Taliban routinely use children to attack soldiers, sometimes paying them with money, sometimes giving them radios, a much sought after item for an Afghan child, the irony being that the Taliban banned music when they were in power. I’m in charge of planning the helicopter operations the Brigade conducts. Rest assured, all the times the Apaches make a racket flying over the village has been worth it. They are doing a phenomenal job out here, as are all the other aircraft and crews. 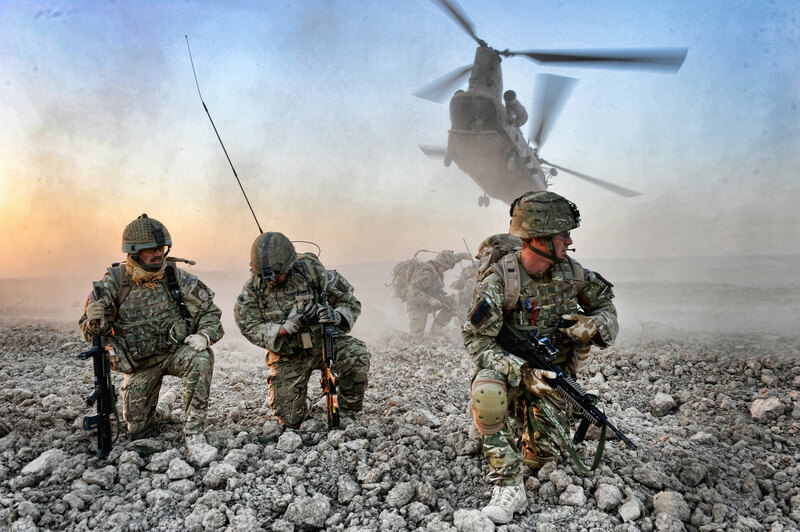 The Chinooks, the big troop carriers and work horses of the Brigade, regularly take fire going into hot landing sites, rounds punching neat, deadly holes through the fuselage and Rocket Propelled Grenades taking chunks out of the airframes. To fly into a landing site knowing the enemy have ambushed the ground troops specifically to target you, the emergency response medical helicopter that will undoubtedly follow, takes a coolness and focussed detachment that I have seldom seen outside the bizarre arena of armed conflict. Don’t think for one moment our pilots don’t make it as hard as they can for the enemy to get a result: the Apaches swirl and dive, clearing the way for the huge Chinooks, bringing fire down so accurately their rounds can land within a few feet of friendly forces. The Chinooks themselves may be nearly 12 tonnes but are hurled around the sky like sports cars, firing their own weapons as they run in to try to ruin the opponent’s day or at least make him lose interest in the fight. They fling themselves at the ground, each landing more like a controlled crash. As soon as the casualties are on board the cab’s lifting, 20 seconds tops, and if you’re getting on too you’d better be in and strapped down fast because it’s not waiting. Blasting back into the air and sprinting for cover, popping flares to confuse any heat seeking missiles that may be chasing you, the pilot stands the cab on its tail to get high, through the small arms threat band that’s the real aircraft killer out here, into the safety of altitude. The American General in charge of all aircraft in this part of Afghanistan said a few weeks ago, “You Brits fly your helicopters like you stole ‘em”. Yessir, we do. That’s why the peaceful Bildeston afternoons are sometimes shattered. I normally knock off about 10 o’clock, grab a quick shower and listen to my iPod for a while. When I realise I’m dreaming the sound I force myself awake and take the headphones off. My book lies next to my bed, practically untouched. This article first appeared in the Bildeston Bugle in November 2010.